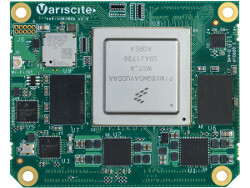 Variscite announced Linux-powered “VAR-SOM-MX8” and “SPEAR-MX8” modules with an up to an i.MX8 QuadMax SoC plus up to 8GB LPDDR4 and 64GB eMMC. It also previewed a VAR-SOM-6UL COM. (click images to enlarge)Other showcased COMs that we covered in recent months include the quad -A35 i.MX8X based VAR-SOM-MX8X and the quad -A53 i.MX8M based DART-MX8M. Variscite also announced a VAR-SOM-6UL module with support for the i.MX6 UL (UltraLite), ULL, and most recent ULZ low-power IoT SoCs. The board has yet to be fully documented, but we’ve listed what’s available farther below. Due to ship with the similar, but more advanced, SPEAR-MX8 (see farther below) in the second quarter, the 67.6 x 51.6mm VAR-SOM-MX8 is pin-to-pin compatible with other VAR-SOM modules, including the new wireless-enabled version of the circa-2014 VAR-SOM-MX6. The VAR-SOM-MX8 ships with the high-end i.MX8 QuadMax or the mid-range QuadPlus models. The i.MX8 QuadMax features 2x Cortex-A72 cores, 4x Cortex-A53 cores, 2x Vivante GC7000XSVX GPUs, and 2x Cortex-M4F real-time cores. The QuadPlus is identical except that it only has one Cortex-A72 core. 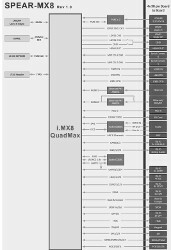 (click images to enlarge)Other i.MX8 SoCs that support both the QuadMax and QuadPlus include Congatec’s Conga-SMX8 SMARC module, which also offers the DualMax variant. The others focus on the QuadMax, including the Toradex Apalis iMX and iWave iW-RainboW-G27M. The VAR-SOM-MX8 runs Yocto Project based Linux (Sumo release) or Android 9.0 “Pie,” both with Linux kernel 4.14.78. The module ships with 2GB to 8GB LPDDR4 and 4GB to 64GB eMMC. It supports 2x GbE ports and offers a wireless module with certified 802.11ac and Bluetooth 4.2 BLE. Media I/O includes HDMI v2.0a, eDP 1.4, and DP 1.3, all with resolution up to 4Kp60. There are also MIPI-DSI and dual-channel LVDS connections for up to 1920 x 1080 pixels with resistive or capacitive touch support. For audio, you get analog I/O, a headphone driver, digital and analog stereo mic support, and I2S/SAI digital audio. The module supports USB 3.0 OTG and USB 2.0 host ports, as well as 5x UART, 4x I2C, 4x SPI, and 2x CAN/CAN-FD (FlexibleData-Rate). Other I/O includes PCIe Gen 3.0, SD/MMC, and optional JTAG. The 3.3V module supports 0 to 70°C, -20 to 85°C, and -40 to 85°C temperature ranges. There’s a product longevity guarantee through 2033. The SPEAR-MX8 is only slightly larger than the VAR-SOM-MX8, at 68 x 55mm, but it packs in a lot more features. On the other hand, it lacks the pin-to-pin compatibility with other VAR-SOM models. The module offers only the high-end i.MX8 QuadMax. 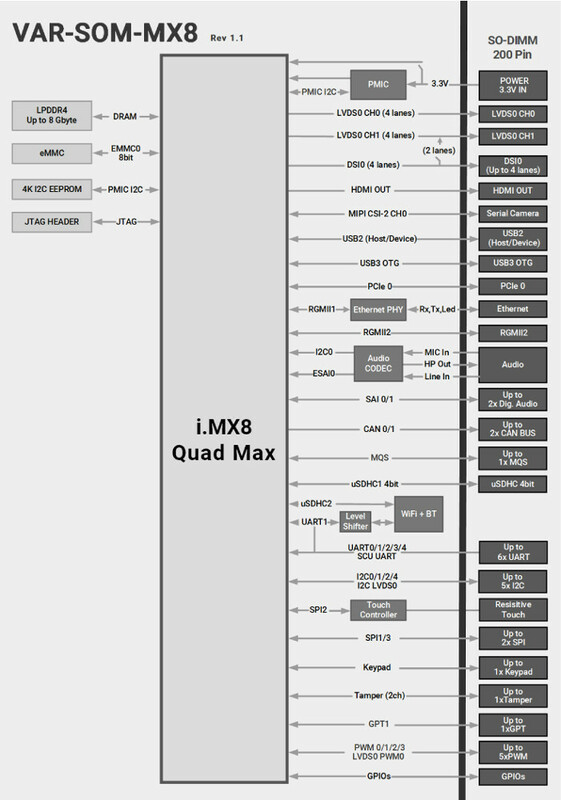 (click images to enlarge)The SPEAR-MX8 appears to have all the features of the VAR-SOM-MX8 with several key additions. These include support for SATA III storage, an HDMI 1.4 input, and dual MIPI-CSI2 camera links. It adds a third USB connection, which is variably listed as a second USB 3.0 and a second USB 2.0 OTG. You also get a second PCIe link and a third CAN port. The module has a heftier 3.4-4.5V DC input. Variscite did not have much to say about the upcoming VAR-SOM-6UL module, which like the smaller, 50 x 25mm DART-6UL, uses a slightly stripped down i.MX6 ULZ SoC in addition to the UL and ULL models. All these single Cortex-A7 SoCs, which are here clocked to 900MHz, are notable for their low power consumption. VAR-SOM-6ULThe VAR-SOM-6UL will ship with certified dual-band WiFi 802.11ac, Bluetooth/BLE, and support for dual Ethernet ports, dual USB ports, and serial interfaces. Media interfaces include 24-bit Parallel LCD, 18-bit LVDS up to WXGA, audio I/O, and a camera input. The VAR-SOM-MX8 and SPEAR-MX8 modules are available in eval kits for “early partners” and will launch in Q2. There’s no ship date for the VAR-SOM-6UL, which is now open for pre-orders for eval kits and samples. 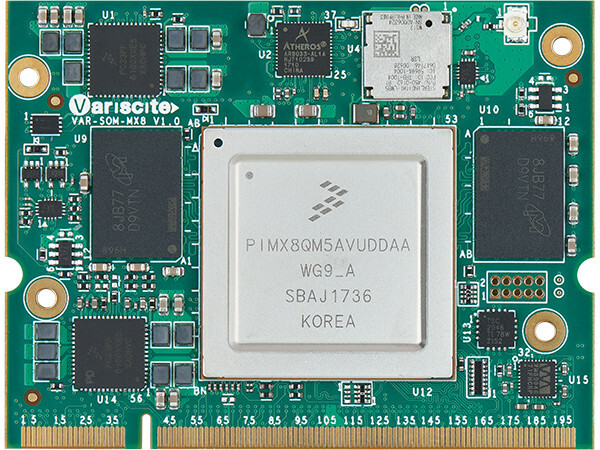 More information may be found in Variscite’s i.MX Embedded World announcement, as well as the VAR-SOM-MX8 product page and wiki and the SPEAR-MX8 product page. This article originally appeared on LinuxGizmos.com on February 22. 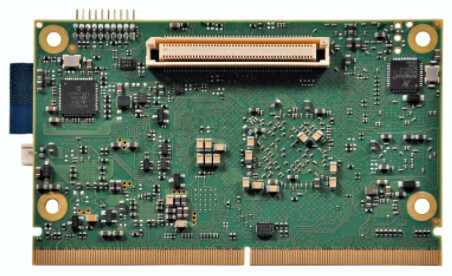 Kontron invented the ULP-COM standard that formed the basis of the SMARC form factor, and it has delivered numerous SMARC modules over the years, including Arm products such as the Nvidia Tegra K1 based SMC-NTKE1. 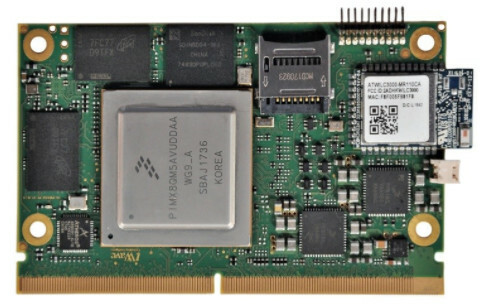 Now it has unveiled the first module we’ve seen in any form factor with NXP’s dual-core, Cortex-A72 powered QorIQ Layerscape LS1028 SoC. The 82 mm x 50 mm SMARC-sAL28 module runs a Yocto Project based Linux stack (with U-Boot) on the LS1028. The module exploits the SoC’s Time Sensitive Networking (TSN) support with up 2x or 5x TSN-capable Gigabit Ethernet ports. 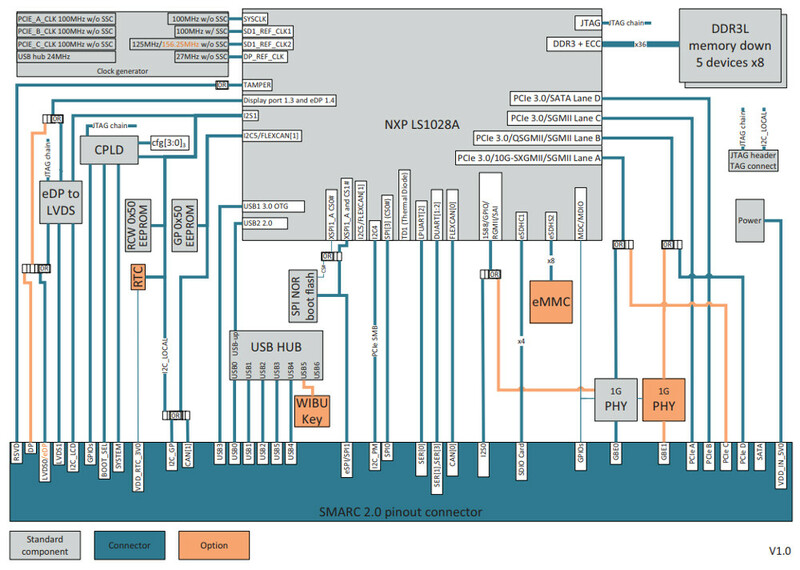 No clock rate was listed for the LS1028 SoC, which NXP refers to as the LS1028A. The SoC integrates a four-port TSN switch and two separate TSN Ethernet controllers. Like NXP’s other networking oriented LSx QorIQ Layerscape SoCs, it supports NXP’s EdgeScale suite of secure edge computing device management tools. It’s the only LSx SoC that features a 3D graphics capable GPU. (click images to enlarge)The SMARC-sAL28 ships with 4GB of soldered DDR3L with optional ECC, as well as 2GB to 64GB eMMC 5.1 storage. The 3V-5.25V module supports -40 to 85°C operation. Two models are available. One has 2x TSN-capable, switched GbE controllers “that can be directly used by the carrier,” says Kontron. The second version supports 4x switched TSN-capable GbE ports via the QSGMII interface with an additional TSN-capable GbE controller. This second option provides a total of 5x TSN-ready GbE ports ports “using a quad-PHY on the carrier.” This 5x GbE model sacrifices one of the 2x PCIe x1 interfaces, which can also be deployed as a single PCIe x4 connection. The SMARC-sAL28 provides a dual-channel LVDS interface, one of which can be swapped out for eDP as a BOM option. 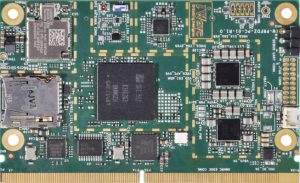 The second LVDS offers a BOM option swap-out for either an HDMI or DisplayPort. The module is further equipped with a single USB 3.0, 6x USB 2.0, and 4x RX/TX serial interfaces. 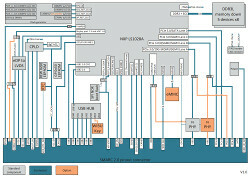 Other I/O includes 2x I2C, 2x SPI, 12x GPIO, and single SDIO, CAN, and I2S connections. Options include a Wibu security chip with Kontron Approtect security software, as well as an RTC. The SMARC-sAL28 is “coming soon” at an undisclosed price. More information may be found in Kontron’s SMARC-sAL28 announcement and product page. Axiomtek has announced its ongoing collaboration with Alert Innovation. Alert Innovation has been tapped by Walmart to use its robotics technology to automate their grocery operations. 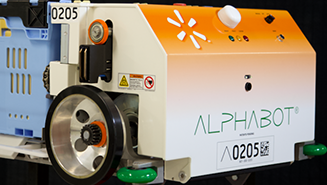 The company has developed the Alphabot system, an Automated Storage and Retrieval System (ASRS) that is also an Automated Each-Picking System (AEPS). Axiomtek’s embedded computers and SMARC System on Modules (SOMs) are used in the system. For a period of almost two years prior to the announcement of the Alphabot pilot test in a Walmart Supercenter, the Axiomtek team worked alongside Alert Innovation’s engineering team, helping to identify and customize products for Alert’s use, participating in schematic reviews and supporting driver development to ensure seamless integration. Since then, Axiomtek has continued to invest in and support the Alert Innovation Alphabot system’s mission. iWave has unveiled a rugged, wireless enabled SMARC module with 4 GB LPDDR4 and dual GbE controllers that runs Linux or Android on NXP’s i.MX8 QuadMax SoC with 2x Cortex-A72, 4x -A53, 2x -M4F and 2x GPU cores. 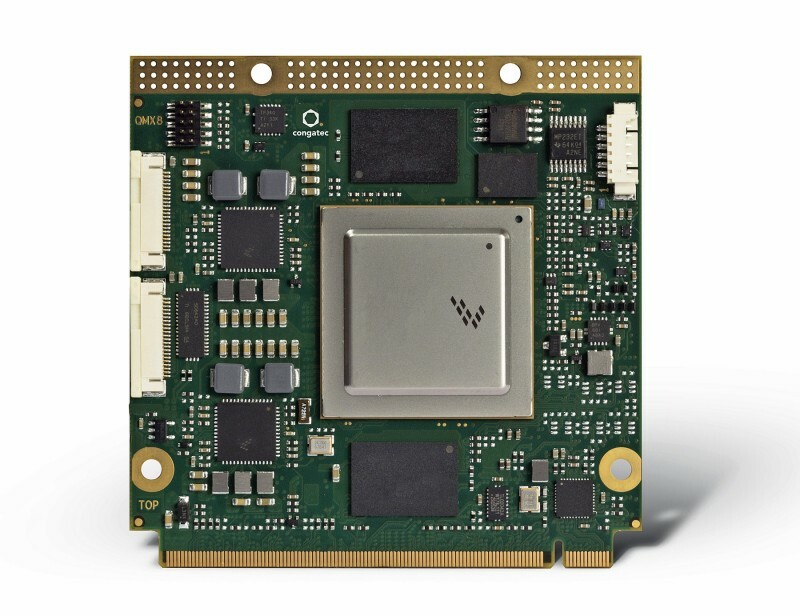 iWave has posted specs for an 82 mm x 50 mm, industrial temperature “iW-RainboW-G27M” SMARC 2.0 module that builds on NXP’s i.MX8 QuadMax system-on-chip. The i.MX8 QuadMax was announced in Oct. 2016 as the higher end model of an automotive focused i.MX8 Quad family. 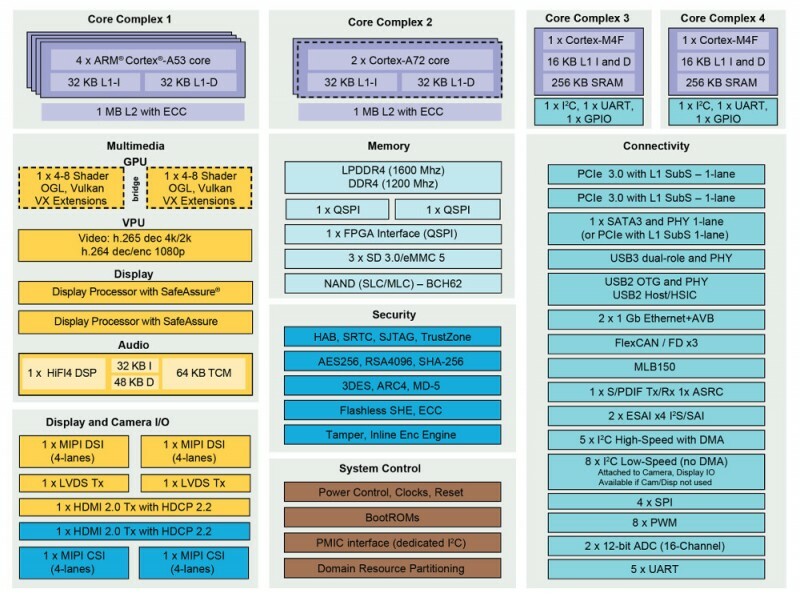 Like Rockchip’s RK3399, NXP’s i.MX8 QuadMax features dual high-end Cortex-A72 cores and four Cortex-A53 cores. 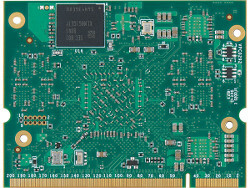 NXP also offers a similar i.MX8 QuadPlus design with only one Cortex-A72 core. 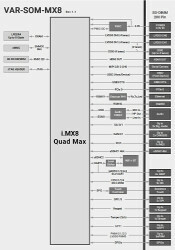 The QuadMax clock rates are lower than on the RK3399, which clocks to 1.8 GHz (A72) and 1.2 GHz (A53). Toradex says the Apalis iMX8’s -A72 and -A53 cores will clock to 1.6 GHz and 1.2 GHz, respectively. 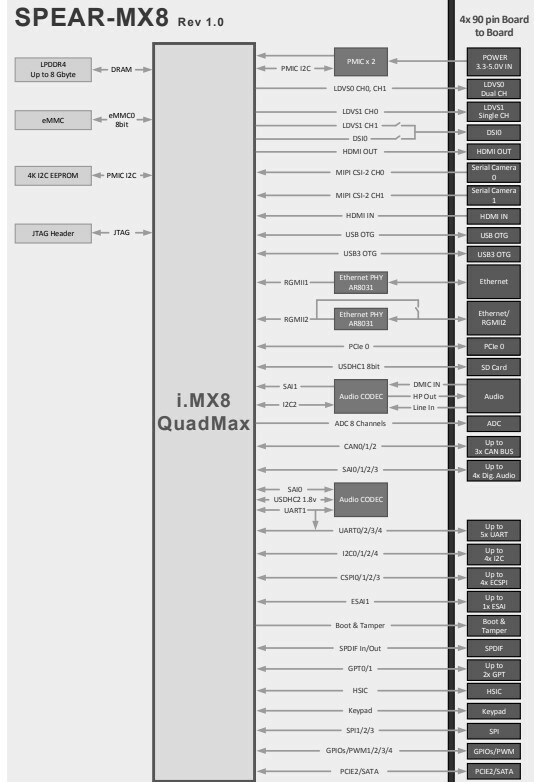 Whereas the i.MX8M has one 266 MHz Cortex-M4F microcontroller, the Quad SoCs have two. A HIFI4 DSP is also onboard, along with a dual-core Vivante GC7000LiteXS/VX GPU, which is alternately referred to as being two GPUs in one or having a split GPU design. Like Toradex, iWave is not promoting the automotive angle that was originally pushed by NXP. iWave’s module is designed to “offer maximum performance with higher efficiency for complex embedded application of consumer, medical and industrial embedded computing applications,” says iWave. Like the QuadMax based Apalis iMX8, as well as most of the i.MX8M products we’ve seen, the iW-RainboW-G27M supports up to 4 GB LPDDR4 RAM and up to 16 GB eMMC. iWave notes that the RAM and eMMC are “expandable,” but does not say to what capacities. There’s also a microSD slot and 256 MB of optional QSPI flash. Whereas Apalis iMX8 has a single GbE controller, iWave’s COM has two. It similarly offers onboard 802.11ac Wi-Fi and Bluetooth (4.1). 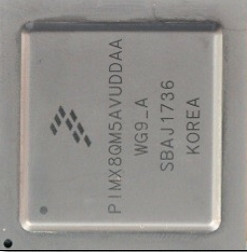 The Microchip ATWILC3000-MR110CA module, which juts out a bit on one side, is listed by Digi-Key as 802.11b/g/n, but iWave has it as 802.11ac. Media features include an HDMI/DP transmitter, dual-channel LVDS or MIPI-DSI, and an SSI/I2S audio interface. iWave also lists HDMI, 2x LVDS, SPDIF, and ESAI separately under “expansion connector interfaces.” Other expansion I/O is said to include MLB, CAN and GPIO. The 5 V module supports -40 to 80°C temperatures. There is no mention of a carrier board. No pricing or availability was listed for the iW-RainboW-G27M, but a form is available for requesting a quote. More information may be found on iWave’s iW-RainboW-G27M product page. This article originally appeared on LinuxGizmos.com on March 13. Congatec has announced support of the new 64-bit NXP i.MX8 processors for the Qseven and SMARC module standards. As a member of NXP’s Early Access Program, the new congatec modules will be available in time with the production launch of the new ARM Cortex A53 / A72 based processor family. This enables OEM customers to implement their first-to-market strategies efficiently, since they can start designing the carrier board for their applications now and will be able to leverage application-ready i.MX8 based Congatec modules from day one of the launch date. 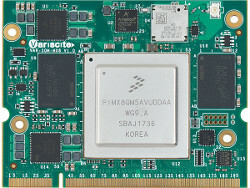 The new Qseven and SMARC modules with NXP i.MX8 real-time processors are well suited for a wide range of industrial, stationary and in-vehicle applications, as the processors integrate up to four cores and high-performance graphics for up to four independent displays with low energy consumption. Since the modules are designed for the extended ambient temperature range from -40°C to +85°C, they can also be used in fleet systems for commercial vehicles or in infotainment applications in cabs, buses and trains as well as all the new electric and autonomous vehicles. 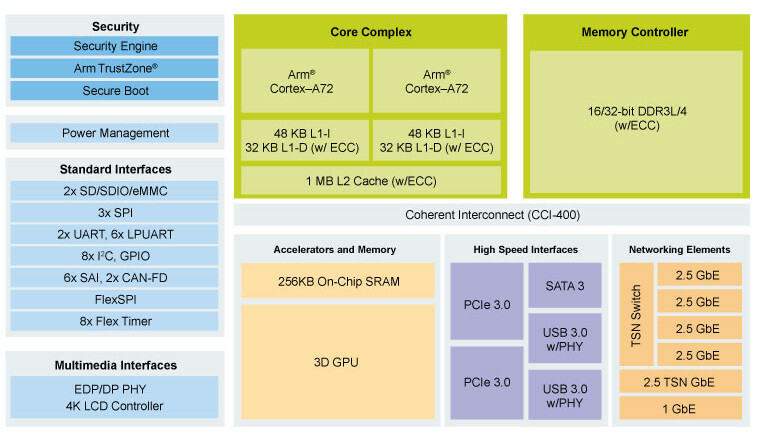 The acceptance of these new platforms is accelerated by the widespread use of ARM technologies in the consumer electronics market, which further reinforces the dominance of ARM technology, especially in the (ultra-) low-power segment of embedded computer technologies. Congatec offers numerous important services around its modules, allowing design engineers to fully concentrate on the new features: The offer ranges from starter kits to EDM services and encompasses everything the developer’s heart desires. With congatec’s personal design-in support, OEMs also benefit from expert premium service from requirement engineering through to serial production. The first congatec modules and matching starter kits will be presented at Embedded World 2018 in Nuremberg. Customers can order starter kits with Qseven modules based on NXP i.MX6 processors today to enable them to switch to the new 64-bit platform the moment the new modules are launched. The first batches will be limited; interested OEM customers should register now for the exclusive congatec i.MX8 Early Access Program. iWave Systems has launched its latest System On Module based on Qualcomm’s Snapdragon 820 chipset in the SMARC R2.0 form factor. The SOM integrates Qualcomm’s APQ8096 SOC offering 64-bit Quad Kryo CPU, with on SOM 802.11a/b/g/n/ac Wi-Fi, BT4.1 and the GPS support. The Qualcomm APQ8096 SOC incorporates 64-bit Quad Kryo CPU, among which are Dual Kryo cores Gold cluster operates at 2.15 GHz and Dual Kryo cores Silver cluster operates at 1.6 GHz. It also includes Adreno 530 3D Graphics at 624MHz, H.265 4K60 HW decode, 4K30 HW encode and Qualcomm Hexagon 680 DSP at 825MHz. 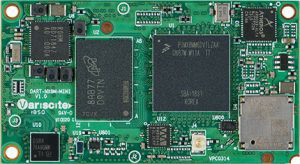 The Snapdragon 820 SOM module is intended for high end embedded computing applications which require high processing power, graphics and multimedia capabilities such as augmented and virtual reality, 4K digital signage, media streaming, Connected home & entertainment, High end wearables, drones, secure POS, video analytics and more. 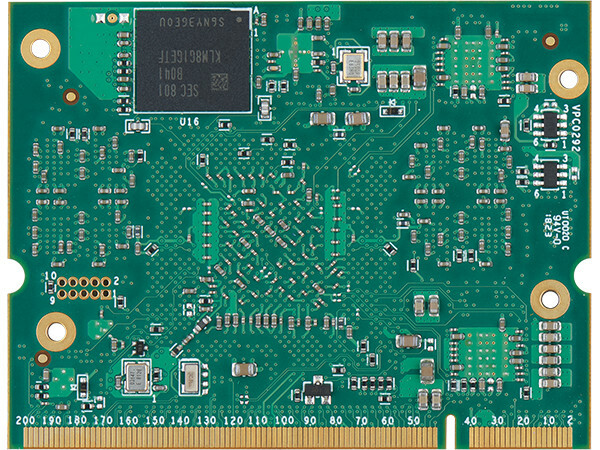 The modulesupports 3 Gbytes of LPDDR4 RAM and 32 Gbytes eMMC Flash with optional micro SD card support. This SOM is supported with Android BSP support at the launch and followed by Linux.